We designed Mauritius as a base for play, for relaxation, and for exploration. She's designed for an owner who is passionate about the ocean and loves to share his leisure time with family and friends. Mauritius incorporates the graceful lines and sea kindly attributes of a modern sailing trimaran with generous accommodation, storage, and socialising spaces for long term cruising. DINING IN OR OUT TONIGHT? The saloon and cockpit areas are almost indistinguishable being separated only by an unobtrusive ring frame and grate in the floor. This arrangement creates a great open space for living in the tropics which is where Mauritius will be found most of the time. 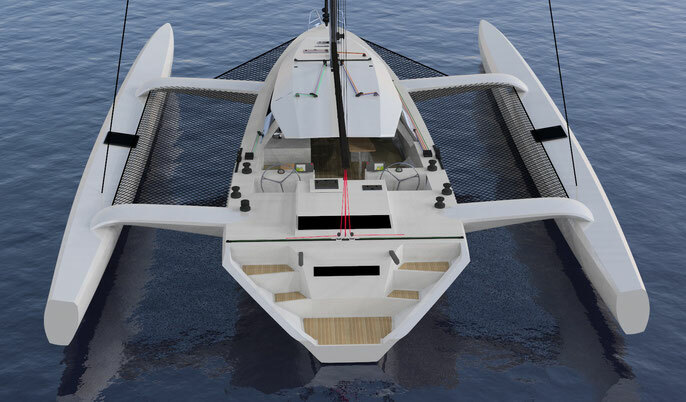 Mauritius may be an enticing choice for a cruise but she retains the same design characteristics that have been the key to the success of our lightweight racing trimarans . 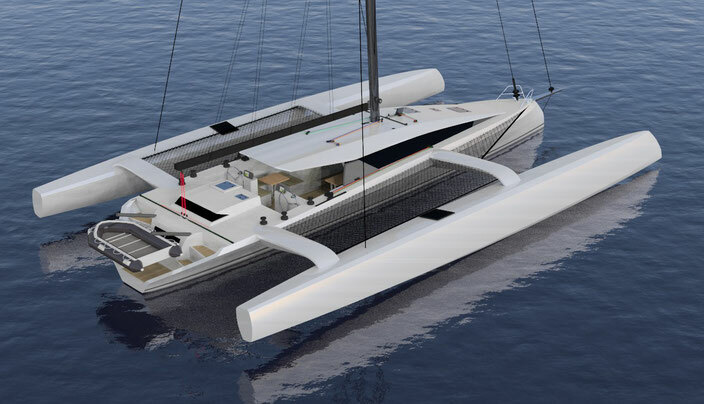 Mauritius sports a fine waterline, high buoyancy floats, good beam clearance from the waves, the rig well aft and a clean aerodynamic profile. It's these features that allow you to sail in a broader range of conditions and experience a better motion when the sea is lively. The broadly splayed hull shapes aft afford a wealth of deck space, storage for water toys and, best of all, twin helm stations with vision to each side and over the cabin top from the raised helm platform. Davits on the aft deck provide for easy dinghy stowage. The davits can be in tubes that allow them to be retracted when not in use, however there is still good access forward each side of the aft cabin even with the davits in place. The dinghy shown here is 3.4m long. The term "galley" probably doesn't do justice to the kitchen area in Mauritius. There's space for a range of appliances to suit the most discerning of pan handlers, and to port there's ample space for a dedicated nav station without robbing the saloon of valuable seating. The aft deck is the access point on any cruising boat. It creates the first impression and it needs to be both welcoming and practical. The broadly flared deck aft on Mauritius provide for easy access on and off the boat. There's space for your dive gear, your surfboard and SUP can go on the davits while the dinghy's in service and you can easily throw your luggage and groceries on the aft deck when you arrive in the tender. Like to sit up in bed to read, meditate, or check the channels? 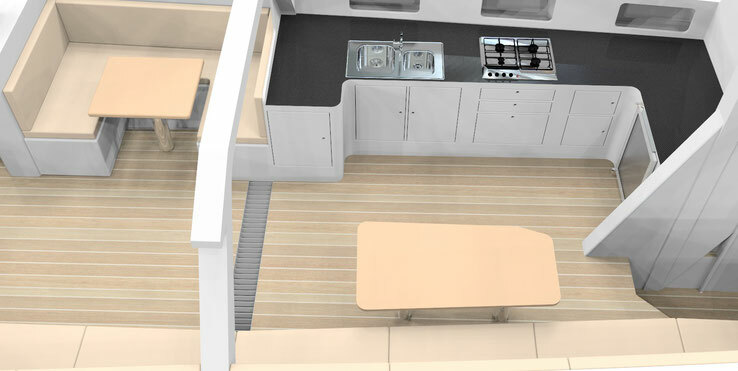 All three cabins share a minimum of 2m (6'6") of headroom over the floor and 1m (3'3") over the berth. 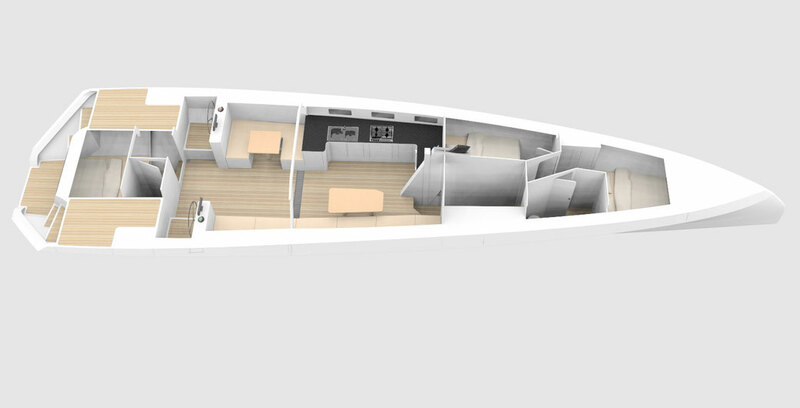 The forward cabin berths are 2m long x 1.5m wide . 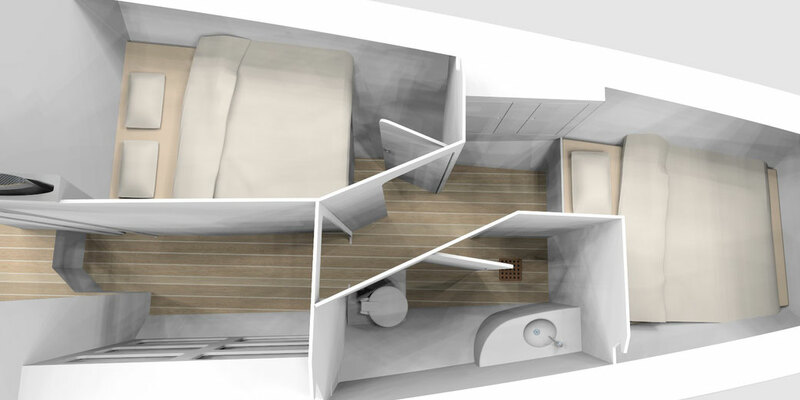 The aft berth is so wide you can sleep at any angle of your choosing and still have space to spare.